It probably sounded like a good idea. Put a bunch of sails on your vehicle and let the wind do the work. 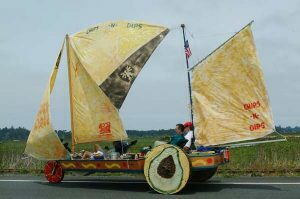 However, leaving Arcata, there was a stiff headwind, and the team didn’t seem to think about lowering the sails. I’m not sure if the judges award extra points for stupidity, but they might. It’s that kind of race.